Playing cards inspired by stained glass, designed by Gertrude Kümpel, Zurich, 1989. Although not actually located inside a church window these playing card designs successfully imitate subtle tones of light filtering through coloured glass. To make your own faux-stained glass playing cards you could print images onto high gloss laminate and fix them on the windows! 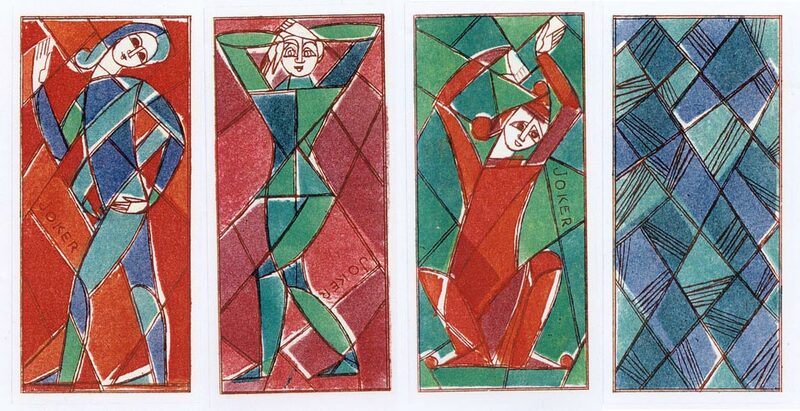 Above & below: Playing cards inspired by stained glass, designed by Gertrude Kümpel, 1989. Above: Playing cards inspired by stained glass, designed by Gertrude Kümpel, 1989.